Missy headed to the OR at 3:30 this afternoon and was back in the room by 8:30. I can't see how long the incision is, maybe 6"? They removed a lot of infection and fluid and gave her 2 more drains, she hates those! We will speak with the Dr. in the morning to see how long she will have to stay in the hospital. Heidi won her JV soccer game, Yeah! Will still has a fever, Boo! If he has one in the morning, he will be visiting his Dr., and Ryan is doing GREAT!! Les, Missy, Heidi, Will and SuperRyan. A week later and Missy is worse. We took her to the Emory ER last night because her high fevers just keep coming back. It appears there is an infection complication from the expander. She has started a broad base antibiotic and will be heading to the OR this morning to have fluid removed that has caused a lot of swelling and pressure. I'm sure they will keep her a few days to continue the antibiotic and make sure they have zapped the infection. I feel like I am back from a near-death experience. I have never been so sick in all my life. Let me tell you, if you start feeling the flu coming in get to your doctor's office. Do not pass go, do not stop, go straight to the dr. It really hit me hard lunchtime on Wednesday. I went to see my primary care doc Thursday morning really seeking confirmation that I did indeed have the flu. I wasn't really expecting them to be able to do anything for me, but did they ever. I got a script for Tamiflu which I filled immediately. I had been alternating two Tylenol and one Advil. I knew from our experience with Ryan that ibuprofin really works on a fever. Anyway, I found out I could take 4 Advil every four hours! If my fever didn't come down after 8 Advil, I could alternate Tylenol after 2 hrs. Well, it took every bit of that and a tepid bath to finally get my temp down. And, yes, I did have a flu shot. I am really hoping I have turned a corner. My fever broke during the night and I am just trying to keep the meds going to keep it down. I just hope noone else comes down with it. My mom and my sister, Les, and my dear friend, Karen, have been taking care of me and I would hate for one of them to get it. Please say a prayer that they don't. Today is our sweet Heidi's 15th birthday! Oh My! She is anxious to go and take her driver's test. We are hoping her soccer game will get cancelled today with all this rain. Will is off to his buddy, Jackson's, birthday party tonight and then tomorrow night he is spending the night at the Sunshine House for a sibling gathering. We, or rather, Les will be taking a bunch of girls ice skating tomorrow to celebrate Heidi's birthday-after her driver's test, I'm sure! Sunday is Will's basketball party. Heidi is still practicing basketball for the all-star state tournament in Savannah. Her team (surprisingly) won 2nd place last year and I expect they will do well again. Our awesome, awesome nurse Dawn called to let us know that her sweet boyfriend is shaving his head for St. Baldrick's. Thanks, Dennis, for helping the kids. Please visit the link and make a donation if you can. We will have Ryan's labs drawn this afternoon at Coach Gary's clinic to make sure they are high enough to start chemo on Monday. I am looking into a vitamin supplement to try and improve his marrow. I am on the schedule for Monday for chemo again. I do not look forward to starting again, but neither do I want to delay. It seems like such an uphill battle right now. We do keep moving, though. One day at a time. No rooms available in the new Aflac ward. We will be headed, (severely neutropenic with ANC less than 50) to another floor. Hopefully with nieghbors that are not infectious ! I am not to happy about it but there is nothing we can do. Yes, finally a picture of our SuperRyan! 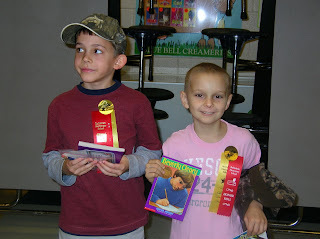 This is him and his buddy, Matt, at Awards Day last week. As you can see they raked them in. You can also see that his hair is coming back. He looks great. He has finished two rounds of the oral vp-16 and goes back next week for another check-up. I don't know when they will repeat his scans, but I am thinking it will be soon. He is playing soccer and having a good time. All the kids are playing. Heidi is actually playing both JV and Varsity at Apalachee. The Varsity had a pre-season scrimmage on Saturday, JV won their game on Monday, and she played Varsity again last night. She was so excited that they let her start the game!! We missed the very beginning. We were running about 5 minutes late from Crawford Long. Les and I ran down there (just a quick jaunt, don't you know?) to get my last drain yanked out. HOORAY! I am officially drain-free (after a mere four weeks). I am really hoping that after the little hole closes up in a day or two, I will really feel like I can move around more, and that will definitely make me feel better. I went to Emory on Monday and met with the onocologist, Dr. O'Regan. She really wants me to have four rounds of doxorubicin (adrimyacin in the breast cancer world) and cytoxan to try and get rid of any microscopic disease hanging around. She feels this is my best chance of not relapsing. So we got started on that right away. The doxo is just a push and the cytoxan runs over an hour. I will go every other Monday again. We got the Neulasta delivered to the house and Les gave it to me last night. Again, I learn more empathy for Ryan. I didn't think that was still possible. That little shot burned-and for awhile! It was great that Ryan was there to hold my hand and make me feel better. It has been very important to him that he comfort me during all of this, and he has done an awesome job. The nausea hasn't really set in. They expect it to in 5-7 days, which means the weekend. Yea! I did come home with four nausea drugs that I have been taking-except for the phenergan. It just zonks you out. I really haven't needed it-maybe this weekend! So, we are trying to keep all the routines going. Heidi has yet another soccer game tomorrow. JV this time. I am working, and have been for a while. My job is really not physically demanding. I see special-ed hospital-home bound students in the mornings and do my speech-kids in the afternoon. I only have groups of three of them so they are all very manageable. The teachers at Bethelehem are all so very supportive and keep me lifted up everyday, and for that I am very thankful. I do want to ask for prayers for two of our cancer friends. Luke Webb is a friend of ours from the Lighthouse. He actually relapsed last year after we met them. They live in Florida, and his mom Carrie is taking care of him and his brother by herself. The chemo he has been taking isn't working anymore and they put him on Ryan's chemo, but it didn't do too much either. She is taking him to CHOP in the next week or so. Please pray for them to get some good answers and a new direction that will lead Luke back to NED and offer them many more years together until we can find a cure. Also, another NB mom could use your prayers. Her daugher Sarah is on a maintaince chemo similar to Ryan, and she is trying to get a definitive diagnosis on breast cancer. I should say on not having breast cancer. Any words of support you could offer would be welcome, I am certain. I wish I had a picture of Ryan playing soccer to post. I will try and get a good one next week. He started practice on Tuesday and on the way he said "wouldn't it be great if we got there and my coach was Coach Mark?" He seems to have a good coach, but, oh yes, it would be great if his coach were Coach Mark. He is so happy to be playing again and is already looking forward to swim season. He has two more days of chemo this round and then gets a week off. He goes back to the dr for a check-up in a couple of weeks.